Malaysia is a multiconfessional society, with slightly more than half of its people being Muslims. The internal conflicts the nation has faced have generally been precipitated by ethnicity rather than religion.The country is officially a Muslim state, and the Government actively promotes the spread of Islam in the country and its friendship with other Muslim countries. Nevertheless, other religions are tolerated and the individual’s right to the freedom of worship is listed in the country’s constitution. The government also gives grants to religious bodies of other religions for building projects and other programs. All the major religious festival days of the Muslims, Buddhists, Hindus, and Christians have been declared national public holidays. According the Malaysian constitution, the majority ethnic group, the Malays, are legally defined as Muslim. They constitute 58% of the population, with the remainder consisting mostly of Indians, who are generally Hindus, and ethnic Chinese, who are generally Buddhists. There are also a small number of other indigenous and immigrants; among the latter are Malaysians of Sinhalese, Thai, and Eurasian origin. Many of these immigrant peoples also profess the Christian faith, but there are also Buddhists among the Sinhalese and Thai. Nearly all of the Buddhists in Malaysia live in urban areas, since they are mostly engaged in business or employed in various professions. The general climate of religious freedom in Malaysia indicates that Buddhism may have the opportunity to expand in the future. However, Buddhism has often been described as a gentle religion which does not carry out an active program to seek converts. Recently, a number of Malaysian Buddhist leaders have responded to the decline in religious participation by the children of Buddhist families, have attempted to reformulate their message to address modern life more directly. Groups involved in these education efforts include such as the Buddhist Missionary Society. Missionary Society leaders have argued that, while many educated youths seek an intellectual approach to Buddhism, an equally large number of people prefer to approach the religion through the tradition of ceremony and symbolism. In response to these needs, religious practices are carried out, but in a way that is simple and dignified, removing what can be seen as superstition. 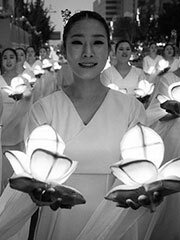 Efforts are made to explain why sutras are chanted, lamps lit, flowers offered, and so on. As a religion without a supreme head to direct its development, Buddhism is practised in various forms, which, although rarely in open conflict, can sometimes lead to confusion among Buddhists. In Malaysia, some ecumenical moves have been made to coordinate the activities of different types of Buddhists. One example is the formation of the Joint Wesak Celebrations Committee of the temples in Kuala Lumpur and Selangor, which coordinates the celebration of Wesak, a holidy commemorating the birth of the Buddha. An initiative has also begun to form a Malaysian Buddhist Council, representing the various sects of Buddhism in the country to extend the work of the development of Buddhism, especially in giving contemporary relevance to the practise of the religion, as well as to promote solidarity among Buddhists in general.